Irene and her family were helped by Nadine Hwang to get on The White Buses. What did they promise her in return? 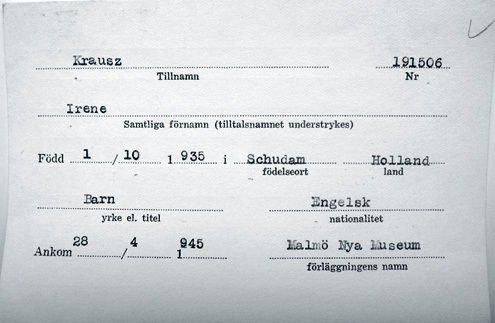 Born in Rotterdam, The Netherlands, 1935, in a secular Jewish family. Experienced anti-Semitism already at the age of five, when she saw big-nosed caricatures on posters in the city. Her parents were frightened and did not allow her to go to pre-school. They kept her at home. 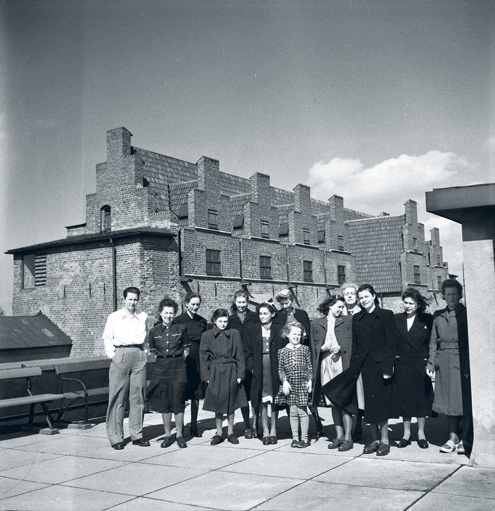 In 1942 the family fled the German occupied Rotterdam to live with relatives in Haag. Irene remembers the English doll she got from her aunt. She brought it with her everywhere. After a while Dutch Nazis knocked on the door and the family was deported to the transit camp Westerbork, between Holland and Germany. Irene’s doll was not allowed to come along. 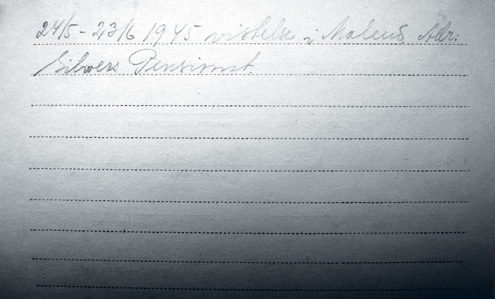 Irene’s father was put on a train to Buchenwald and never saw his family again. Irene, her mother Rachel and Irene’s brother Don were sent to Ravensbrück. Irene, with her blond angel-like hair, quickly became a favourite among the other prisoners. After a while they were used for forced labour at the Siemens factory. Irene remembers this as better than the dirty and overcrowded Ravensbrück, where people were killed or died from diseases. In the camp Irene and her family got to know the Chinese woman Nadine Hwang. Irene saw her as a unique woman. Well educated, lively and with a strong personality. 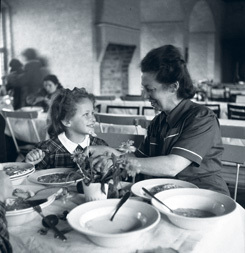 Nadine organised, through Mary Lindell, that Irene and her mother were included in the list with British people to be rescued by the White Buses. Rachel promised Nadine Hwang, that if Irene ever gave birth to a daughter, she would name her Nadine. Irene kept her mothers promise. Irene clearly remembers the feeling of freedom when arriving to Malmö. They were allowed to shower and get new clothes. In 1946 Irene, her mother and her brother moved to South Africa, where one of Irene’s sisters lived. 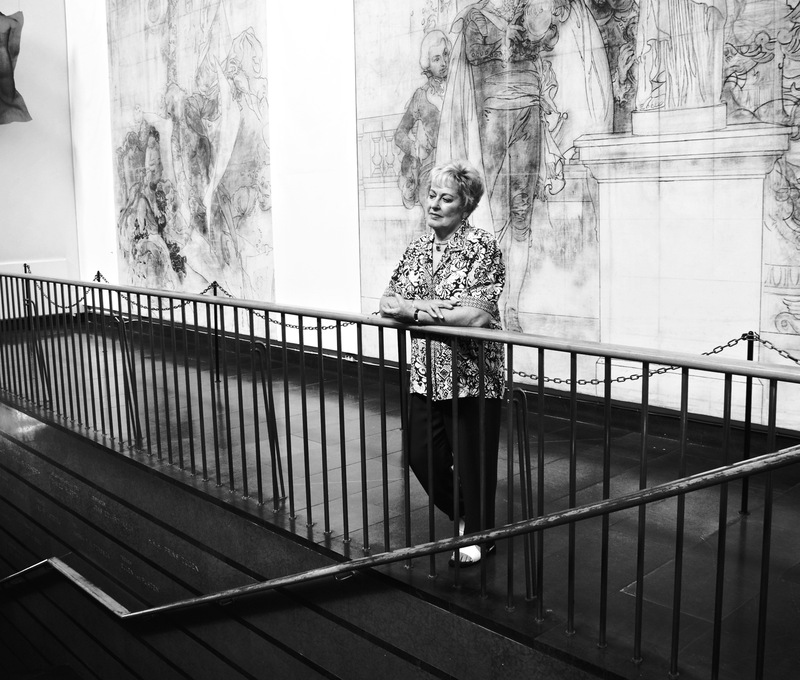 Irene missed several years of her school and felt alienated due to her different language. Irene met the Jewish South African Lester Fainman. They got married and started a family. For a short while Irene lived in a kibbutz in Israel but returned to South Africa. Irene kept her memories from the war to herself for many years and had recurring nightmares. She later started seeing a therapist, which helped her dealing with the memories. Irene Krausz is one of the main characters in Magnus Gerttens documentary Harbour of Hope (2011). If you would like to add further information to Irene Krausz’s story we will be very happy to hear from you. Please write an email to our researcher Sebastian. If you can help us with further information about Irene Krausz-Fainman we will be very happy to hear from you. Please write an email to our researcher Sebastian. 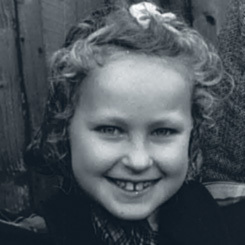 9-year-old Irene Krausz-Fainman after the arrival in Malmö on April 28, 1945. Her mother Rachel beside her (left). Irene and Rachel in the dining room at Malmö museum where they stayed in quarantine. 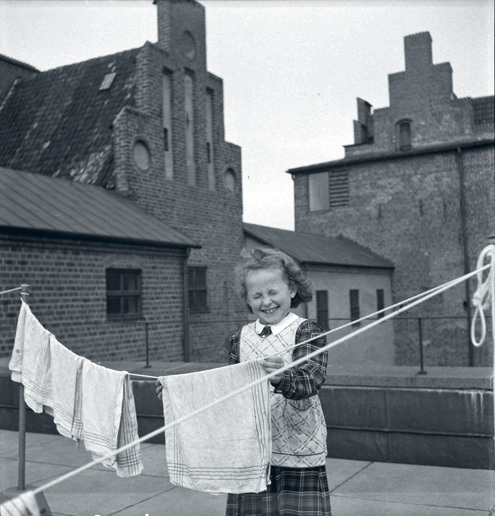 Irene on the rooftop of Malmö museum, 1945. 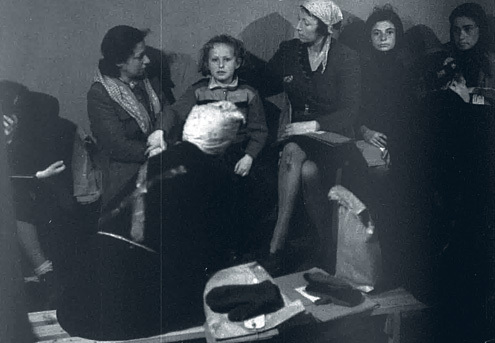 Irene, her mother Rachel and the other survivors from the Ravensbrück camp. Irene’s Red Cross registration card. 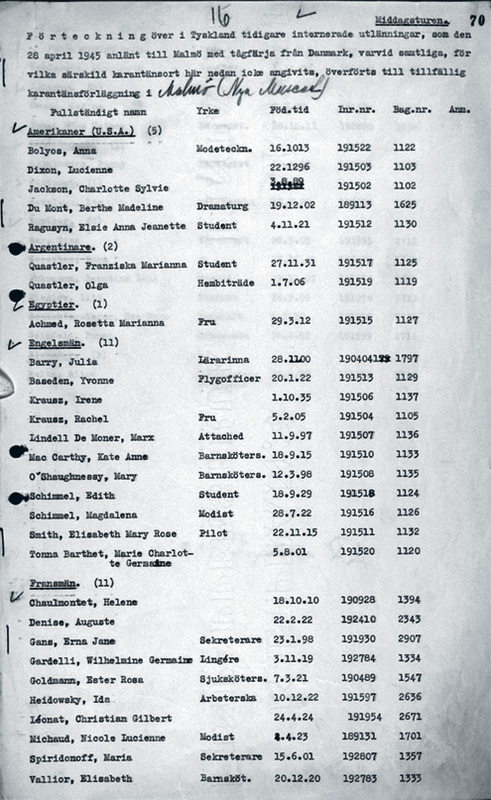 Irene and Rachel were listed as English passengers instead of Dutch to have a better chance of getting on the Red Cross transport in Ravensbrück. Hence, they were also taken down as English on the ferryride to Malmö. Irene Krausz-Fainman tillbaka på Malmö museum 2008.